Over the centuries, there was a great influence of art, culture, literature, and architecture from India to Cambodia. But after a certain time, when Cambodia and India become the cultural, religious and political part of each other, the movement started from Cambodia to India. The purpose of this movement was religion and politics. Even today one can see the pilgrims that are regularly visiting Indian Buddhist sites bringing with them goods and offerings from their home countries. 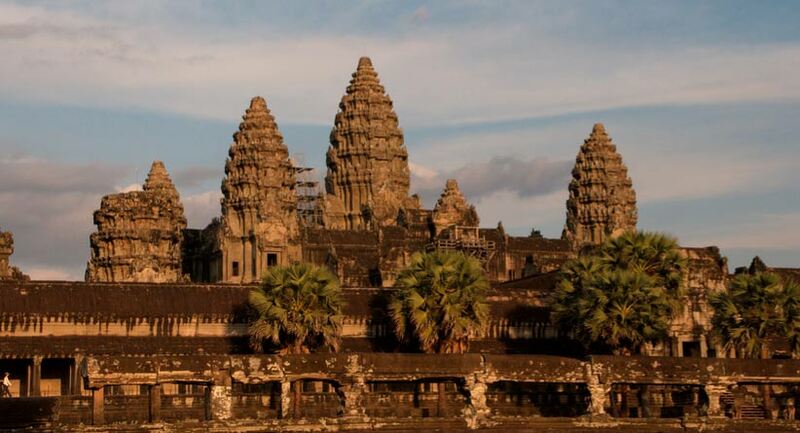 After being influenced in the architecture of India, Cambodia began to develop its own style. This was caused by the interaction with its neighbor countries due to religion, politics and art. As Cambodia’s pilgrims made visits to India, the new style of Cambodian architecture began to spread and came to influence the style of Indian Buddhist architecture. Today, we can see many archaeological sites in India with a style of architecture that differs from the original Indian style. This can be seen especially in the stairs around the stupas, the tiers on top of stupas, the layers on the lower and upper part of stupas, some enigmatic symbols and animal depictions on stupas, and the dissimilar iconography that is carved on stupas. These types of peculiar styles have been observed by the author at Bodhgaya, Vikramshila, Nalanda i n Bihar, Nagarjunikonda in Andhra Pradesh, Ratnagiri, Lalitgiri, Udayagiri, and Sarnath especially. The most prolific Buddhist remains at Sarnath, apart from the sculptures, monasteries, and temples, are the stupas, which come in two forms – gigantic stupas (like Dhamekh) and votive stupas. Nowadays at the site, only structural stupas made of brick with mud mortar and stone with dry masonry can be seen. However, during excavations from British times to the 20 th century, excavators exposed many monolithic, clay, terracotta, metal, seal and other types of votive stupas. The author has also studied the votive stupas made of stone kept in reserve collections. There are hundreds of votive stupa fragments made in tiers style. These are immovable structural votive stupas, though there are about fifty movable votive stupas kept in reserve collections. The location of these type of stupas is in the east side of the Mulgandhakuti and in the south-west direction of the Dhamekh stupa . In order to present them separately, we have kept aside the votive stupas that resemble the last group studied with regards to the motifs and decorations, but differ from them by the fact that they have in the center a personage (rather than a symbol), which is none other than the Buddha, Tara, Avalokiteshwar or other deity. General view of the Southeast Asian votive stupas in situ preserved at the Sarnath excavated remains, Sarnath, Uttar Pradesh. As for its height, according to the exact count of the twelve members of the chain of successive causes (pratityasamutpada), it is twelve modules high. The platform is made round, or with four sides, twelve elements, or twenty angles. Are they annexing structures? Archaeological vestiges have shown that numerous stupas were built in the proximity of larger ones; but neither their number nor their ornamentation permits them to be assimilated with the four caitya (Buddhist shrine or prayer hall) in question here and which represent the four great miracles. This theory is also fit for the above said stone stupa. Now these stupas are kept either in a museum or in reserve collections. The superstructure of the Dhamekh (pictured below) was assumed by Alexender Cunninghan, when he undertook excavations at the top and at all sides of the stupa. He exposed many fragments which resemble the actual shape of stupa in this form as shown in the figure. This is actually Cambodian style. In fact, the replica slabs found in the excavations at Sanchi, Bharahut, Amaravati and Nagarjunikonda, have been the source material of all analyses and writing on the stupas. All the votive stupas are belonging to the early Gupta period to 14 th -15 th century AD. We can see how the stupa could, in different epochs and regions, be so diverse and at the same time constant, still remaining in the center of Buddhist life. Its construction, while being marked by the personality of the artists, obeyed a set of imperatives and norms. The early stupas and votive stupa did not have floral decorations; these were found on the “barrier-balustrade” in the form of lotus-shaped medallions, scrolls and garlands. It was only later, for example in Sarnath and Amaravati, Nalanda, and Bodhgaya, that the stupa proper was covered with striated, jewel-like and floral sculptures. In Gandhara, as well as in the whole of India, stucco debris bearing floral decorations have been found; in Sarnath, these decorations can still be seen on the stupa itself. And the use of stucco or lime decoration over the stupas was started after the Kushana period. In ancient India, the stupa, whether big or small, is always in the shape of a large hemisphere resting on a drum. It is only after the 5 th AD that it underwent two important modifications: the basement on the one hand, and the crown on the other, concurrently increasing their importance to the detriment of the dome. The enlargement of the basement and crown are from the Cambodian influence. Why Different Phases in the Stupas and Votive Stupa? The author does intend to say that all the Cambodian-style stupas are made by the Cambodian visitors or made by the Cambodian artists at Sarnath. It is possible that first Cambodians brought their own style stupa from their land and later the indigenous people of India prepared the same style of stupa. Now the question is, are all the votive stupa specially made in Cambodian style? The response is no. Actually some of the Cambodian stupas have overlapped the previously constructed stupa in the same place. Almost all the big stupas, such as Dharmarajika and Dhamekh, were renovated and beautified later by the visits of pilgrims. There is also the possibility that due to lack of space, and as it is a trend to build votive stupa near the main shrine, they had built over the earlier damaged stupa. This can be understood by the recent activities at Bodh Gaya. Recently, the pinnacle of Bodh Gaya temple was beautified by way of gold plating over the pinnacle by the Thailand queen. The stupa’s profile is extremely varied, depending on the epoch and country, but it is always recognizable, as if it has conserved within itself, through all its transformations, something permanent which characterizes it. This article has examined the shape, size, context, decoration and motif of the stupa in all its variable elements. From the above discussion it seems obvious that the structural stupa architectures have a tendency towards elongation and height. Architecturally, the architects of these stupas favored the principle of vertical expansion rather than horizontal expansion of which architectures of the classical Sarnath, Bodhgaya, Vikramshila, Nalanda, Ratnagiri, Udayagiri, Khandagiri, Amravati, Nagarjunikonda (Sarkar, 1993:83), and Bharahut provide good illustration. These were influenced by the Southeast Asian stupa architecture, especially Cambodian architecture. A similar observation can be observe from the sealing (pictured below), where one can see the different size tiers over the stupa, a Southeast Asian influence.